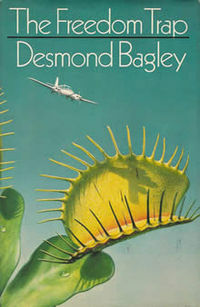 Another novel by Desmond Bagley, author of The Vivero Letter, one of my all time favourite writers. I only wish I could have met him. The Freedom Trap was first published in 1971 and is said to be loosely based on the escape of, spy, double agent and traitor depending on your point of view, George Blake from prison five years earlier. It was made into a film in 1973, called The Mackintosh Man, starring Paul Newman. The story starts with Joseph Rearden who is a villain from South Africa . He meets an agent of MI5 in London called Mackintosh, who recruits him for an assignment. It is a dangerous task and is to trap The Scarperers who are a well known gang of criminals who gaol-breaking long-term prisoners. He is also to catch Slade who is a Russian double agent whom they recently helped to escape. Rearden is told to rob a postman with a packet of uncut diamonds. He is then ‘caught’ and sent to jail in hopes that he can contact the Scarperers. It is a clever and exciting plot which races to Malta and beyond……well worth a read. In the mid 20th century, British writers such as Hammond Innes, Alistair MacLean, Desmond Bagley set out the conventions of the thriller genre. Their heroes were a resilient and resourceful ordinary individuals facing tremendous odds. The villains were utterly ruthless in pursuit of their goals.